August 8, 2017. It is less than 3 weeks until the USATF Masters 1 Mile Road Championship in Flint Michigan. The Championship is one of the events in the Michigan Mile, part of the Crim Festival of Races. 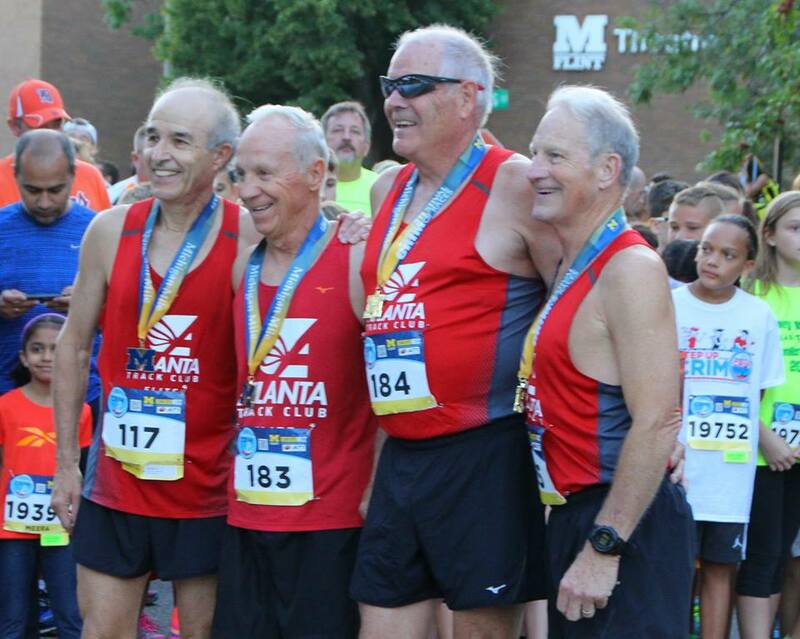 It determines the 2017 Masters Mile National Champions. A fraction of those who will eventually enter are already registered, but based on who is in so far [8/8/17 at 2 pm], there will be some dandy races on Friday evening, August 25th. Don’t miss out! If those winning times look ‘soft’ to you, keep in mind that the traditional Flint course is challenging for a road mile. It is technical with 1 sweeping turn and five 90 degree turns, plus switching from road to paved path through a grassy area and onto the road again. And it has a serious uphill from about a half mile to 3/4ths of a mile. There is a different course this year due to construction; the new course appears to be faster, with one sharp turn and then a gentler turn to the finishing straightaway. The major climb is no longer part of the course but, based on the course map, the race appears to finish uphill. In the previews below, I pick out the top contenders and render a prediction based on current entrants. It is understood that when I do my final set of predictions once registration closes, some of these may be dramatically different, either because of new entrants or updated information about current fitness. John Gardiner has entered to defend his Overall championship, but that will be a tall order. Kevin Castille is also entered. 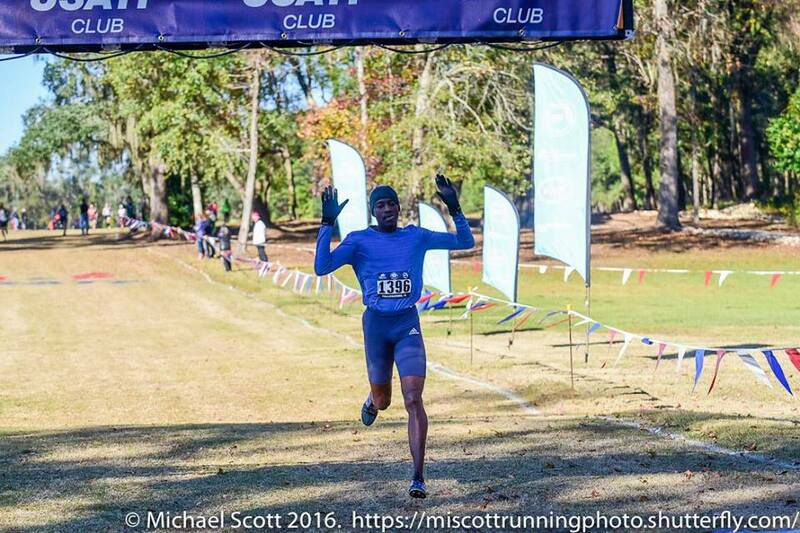 Castille ran a 4:24 mile in Louisiana earlier this year and a 14:30 5K. 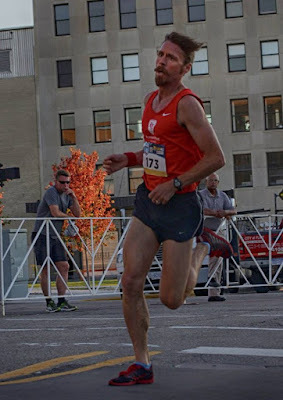 He has bettered the 15K age division record twice this year, at the Gate River Run in March and at the Utica Boilermaker 3 weeks ago in 46:10. If Castille runs, he will be a strong favorite. Who else will challenge Gardiner for the podium? Two years ago, Gardiner’s teammate, Jerome Vermeulen, and Greg Mitchell outkicked Gardiner in a thrilling finish! Mitchell is not back from a hamstring injury yet but Vermeulen is entered. Last year the tables were reversed as Gardiner had the best of Vermeulen. David Angell, who has been on the podium in every Masters Championship race this year, has thrown his shoes in the ring. Although known for the longer races, no doubt Angell, as the 8K Champion, has some speed as well. Another Cal Coast teammate of Gardiner, Christian Cushing-Murray, is also entered. 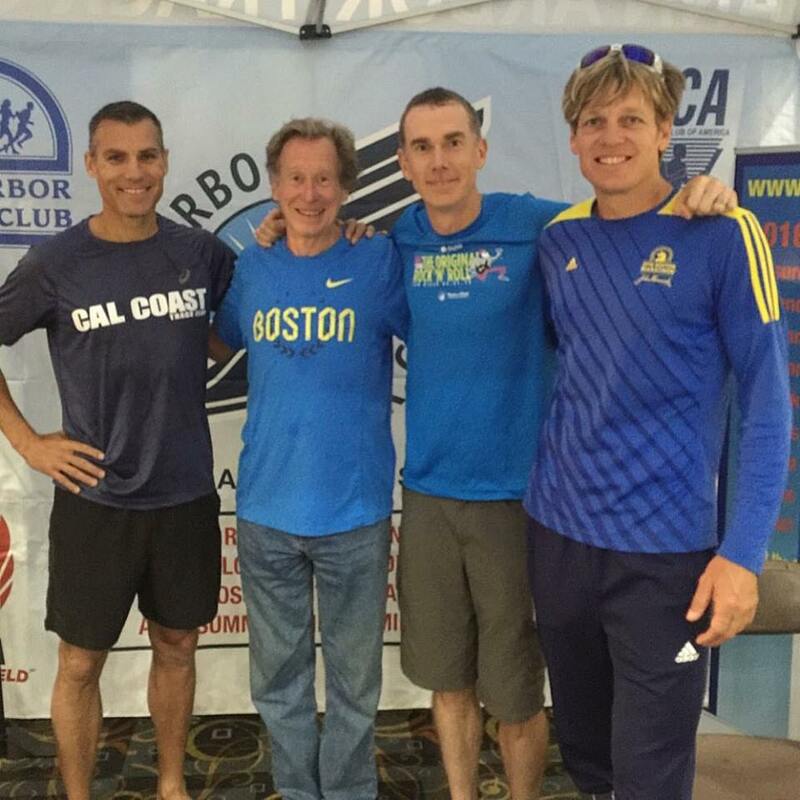 He won the Masters race at the 2016 Carlsbad 5000 in 15:11. But he spent the latter part of 2016 and the first part of 2017 injured. His first race back from the injury was the 2017 Carlsbad where he ran 16:14 to finish 7th. Even with 3 additional months of training, it is uncertain if he will be in condition to challenge for the podium. 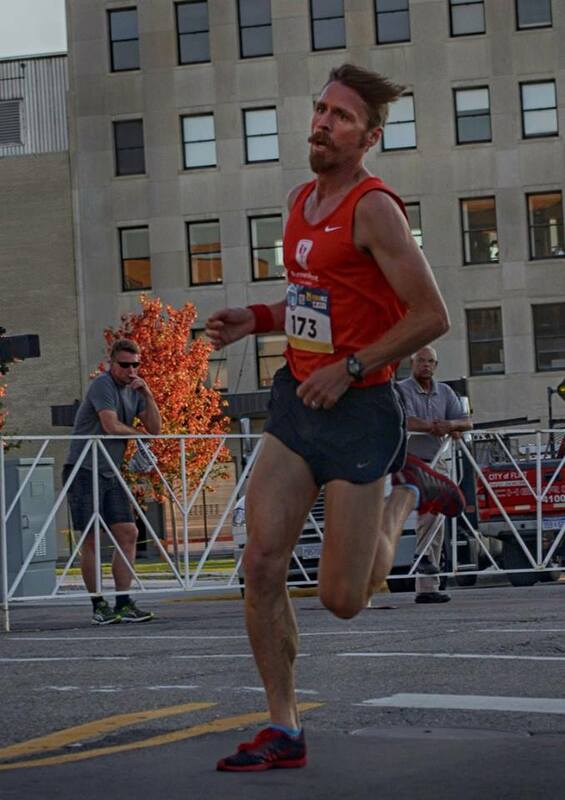 And, like Vermeulen, now a 50 year old, we should not count out Todd Straka, who finished 5th overall in 2015. He is clearly prepped to run a fast mile; earlier this year he ran a 4:26.39 on the track at the Music City Distance Carnival and has run faster this summer, clocking a 4:19.2 at one of those great downhill Colorado mile races. Castille, Gardiner, Angell. 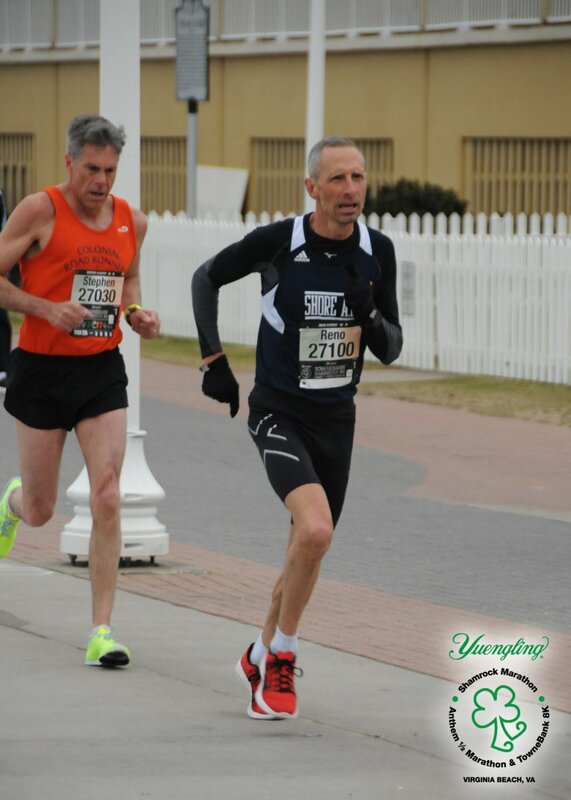 Tom Bernhard, making the turn at the 8K Masters National Championships on his way to victory in the Men's 65 division. On the women’s side, Sabra Harvey is the odds-on favorite at this point. When she won the Age-Grade title in Flint in 2015, Harvey was on the beginning of the comeback trail after injury, so scored ‘only’ 90.77%. At the 10K Championship this spring, she bettered her own 10K record and age-graded at 103.56%. Harvey is also the current World Record holder for the Women’s 65 division at the 1500 Meters on the track. She will be tough to beat regardless of who else might enter. Of those currently entered, Lynn Cooke would be favored for 2nd. 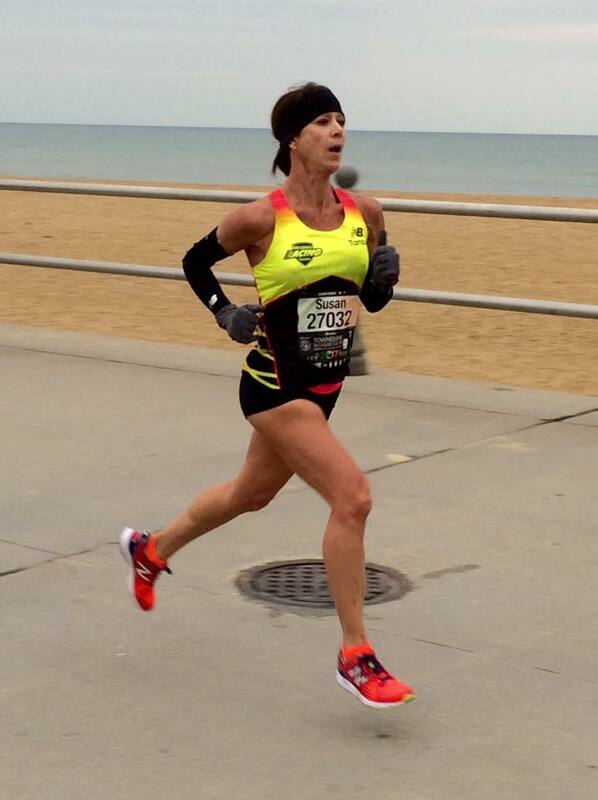 Cooke’s 8K in Virginia Beach netted her a top-5 age-grade finish at 90.54%. The other three who would figure into the podium contest as of now are Jill Miller-Robinett , Melissa Gacek, and Renee Tolan. Tolan’s 5:21 in Pittsburgh would net an 84.55%. Gacek’s fast 5K earlier this year merited an 83.4% age grade and Miller-Robinett scored 82.99% here last year, finishing two places ahead of Gacek in age-grading. If Jo Anne Rowland is fully recovered from injury she could factor in as well. She has not competed at Flint before but has age-graded above 90% at longer distance championships. Harvey, Cooke, Miller-Robinett. Age Divisions—Contenders for the win. 40-44. John Gardiner, the current favorite and defending Overall Champion is also favored here, with David Angell pushing him all the way. Gardiner, Angell. With the defending champion, Tammy Nowik not yet entered, Melissa Gacek, who took 3rd overall last year, and Renee Tolan are the co-favorites. I will give the nod to Tolan for her Liberty Mile 5:21, but know that Gacek will be right there too-it should be a great race! Tolan, Gacek. 45-49. Last year’s winner, Jerome Vermeulen, has aged up to Men’s 50. 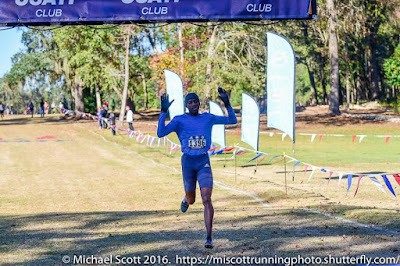 Kevin Castille, who is the Overall Masters favorite, is also favored for this division; he is very likely to crack 4:30. Because he is coming back from injury, Christian Cushing-Murray is a bit of a wild card in this, one of his last few national championship races in the 45-49 division. Castille, Cushing-Murray. Erin Larusso, running for Patient Endurance of Michigan and the defending champion,, is the favorite with her recent 5:41 in Pittsburgh and, of course, her 1st place overall last year in 5:49. There are several other strong runners entered, but none appear to have the speed to challenge her. Larusso. 50-54. The three strongest runners in this division at this point are Todd Straka, Jerome Vermeulen and his teammate, Rob Arsenault. Typically a low 16’s 5K performer, Rob Arsenault is coming off an injury this winter. He ran 19+ at Carlsbad in April. Four months further along, he should be close to his usual speed. I am not aware of Vermeulen’s injury status but he has apparently not run a race since last November. Either he has been very busy or he too may have had some fitness issues. That suggests that Straka, who is racing sharp, may be able to reverse the outcome of two years ago when Vermeulen topped him by 5 seconds. Despite some uncertainty surrounding their current fitness, I will give the nod to Straka, ahead of Vermeulen and Arsenault. Straka, Vermeulen, Arsenault. Michelle Allen and Alisa Harvey are the two contestants entered so far. 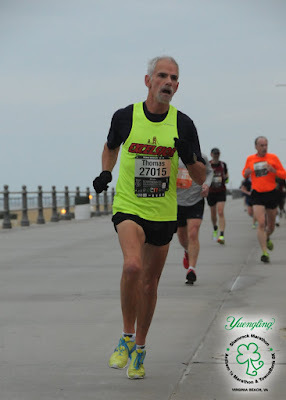 Allen’s recent showings, a 33:07 at the 8K Championships in Virginia Beach and a 42:06 at the 10K Championships in Dedham suggest a strong base. Unfortunately some injury issues slowed her down this summer so she has just recently gotten back to the track for a 1500 M. Still her extensive track work suggests she has the potential for a special road mile. Given Allen’s fitness questions, Harvey becomes the definite favorite based on her 5:29 in the Loudoun Street Mile at the end of May and her 3 recent 5K’s, all just under or just over 20 minutes flat. Christine Vincent, of Playmakers Elite, is not quite that fast but is familiar with the race; home course advantage could work in her favor. Vincent finished 4th last year, just 4 seconds out of 3rd place. When fit, Allen can match those times, but is she fully fit? Harvey, Vincent, Allen. 55-59. Dave Bussard, who skipped last year’s competition, won here in 2015 in 4:57. He looks to be in great condition with his last three 5K’s in 16:59, 17:17, and 17:08. Jeff Haertl, and Fred Zalokar, the Age Division winner at the Marathon Majors, would appear to be his main competition at this point. Haertl ran 5:05 here last year and runs his 5K’s typically in the mid- to upper 17’s. Zalokar would definitely be favored at a longer distance but he has shown good speed at shorter events too; in fact, he finished 3 seconds ahead of Haertl at the 5K Championships in Syracuse last year in 17:13. 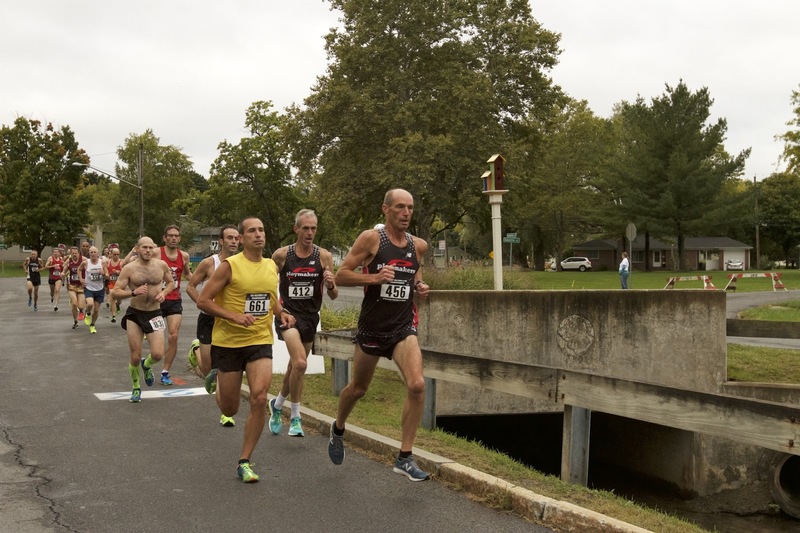 As recently as November 2015, Jeffery Dundas was carrying a 5:47 per mile pace in the 12K Championship in Alexandria, Virginia, and running a 5:08 road mile, but he has had numerous health issues. He just ran a 5:36 Road Mile so he is probably regaining fitness and coming mostly for the team competition. Bussard, Zalokar, Haertl. Susan ‘Lynn’ Cooke is the favorite based on her track experience at shorter distances including a recent 5:42.7 Track Mile. 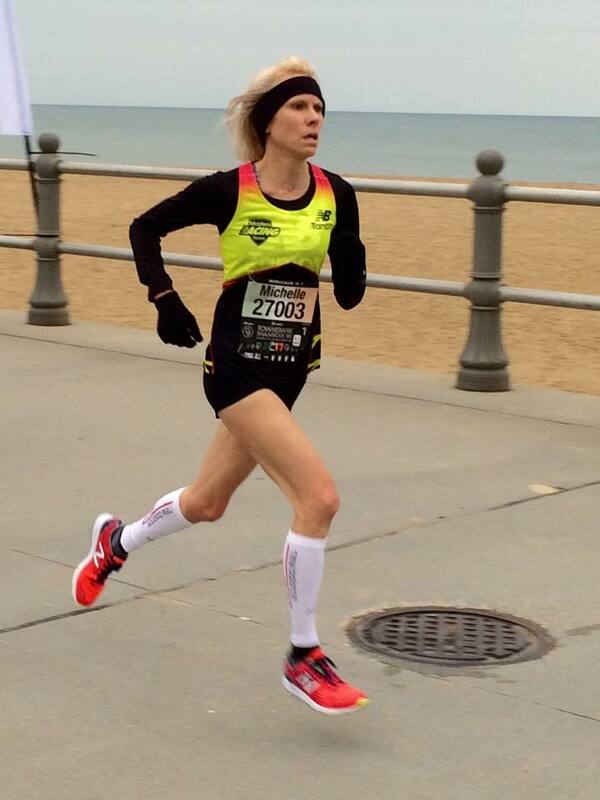 Mary Swan has taken her measure at longer distances, including the 5K Championship, by a half minute, at Syracuse last October and the 8K Championship this spring, by a minute, in Virginia Beach. Endurance vs. speed, this is a classic encounter. In this case I will go with speed but it will be close and could go either way. Cooke, Swan. 60-64. Ken Youngers is the defending age division champion with a winning time of 5:32. But, in the interim, he has had surgery and is not likely to be as fit as last year. He is probably coming more for the team than the individual championship. Michael Young, a new member of Ann Arbor TC’s 60+ team, ran 5:34 last year in the 55-59 division. He has run a recent 5:36 Road Mile and a 38:56 10K this summer. It looks like he should be under 5:40 and that may be enough for the win among the current entries. His toughest challenge may come from Reno Stirrat rather than Youngers. 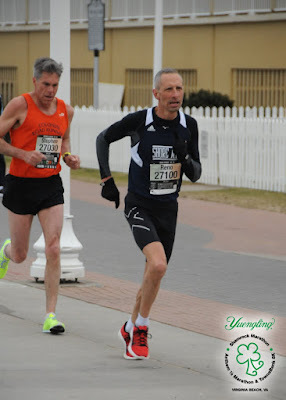 Stirrat has also had some issues, but his recent races include a 39:02 at the 10K Masters Championship and two 10K races this summer at 38:39. Thomas Dever will also be in the hunt; he tends to prefer longer races, but ran an 18:28 5K this past April and then a 1:26:56 Half Marathon in May. 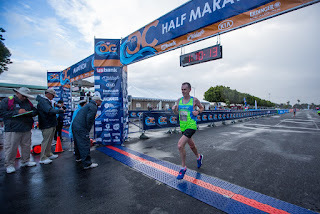 Last year before taking some time off from racing to deal with some nagging issues, he ran his half marathons in the low 1:20’s and his 5K’s in the mid to upper 17’s. If his training has been consistent since then, he could be in the hunt for gold. This race should be a dandy! Stirrat, Young, Dever. Jill Miller-Robinett is the defending champion with a time of 6:38. At present she appears to have the inside track to the victory. Susan Stirrat is a strong runner who will push her all the way but does not have as strong a record as Miller-Robinett. Stirrat has a 6:57.6 Indoor Mile to her credit and ordinarily runs her 5K’s in the low to mid-24’s. 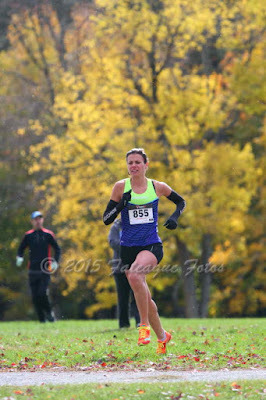 Miller-Robinett, on the other hand, ran 21:42 in the Masters 5K Championships at Syracuse last year. 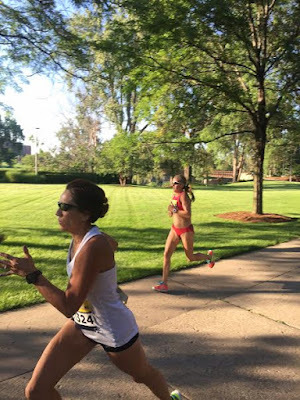 She ran a 22:17 5K on the 4th of July this summer so her current fitness seems to be comparable to last year. Miller-Robinett, Stirrat. 65-69. Tom Bernhard is the defending champion with a 5:18 winning time. Knee surgery over the holidays slowed Bernhard down and then a trip to japan without much training did not help his spring fitness. He hoped for more consistent training over the summer but the 5K he ran on the 4th of July was 18:26, about a minute slower than he ran in the same race a year earlier. That suggests a time under 5:30 this year would be unlikely for Bernhard and it may be that 5:40 is a better prediction. His strongest competition so far would be from Kirk Larson who ran 5:47 last year. Larson’s two 5K races this summer have both been 19 minutes plus. Bernhard is still the favorite but the race could be a little closer than expected. Bernhard, Larson. As noted in the Age-Grading section, Sabra Harvey is entered, and is a very strong favorite. 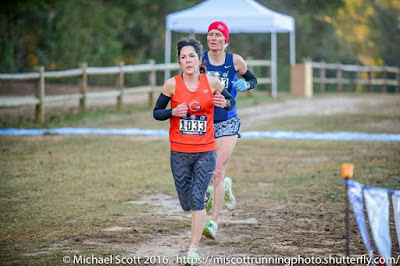 She wins almost every age division race she enters and has even beaten the legendary Kathy Martin over shorter distances. The mile is right up her alley and it seems unlikely anyone can get close to her. She ran 5:38 to take the 2016 1500 meter race at the Outdoor TF Championships. That time is roughly equivalent to a 6:09 Mile. Her winning time in 2015 was only 6:25 but she was coming back from an ankle injury. 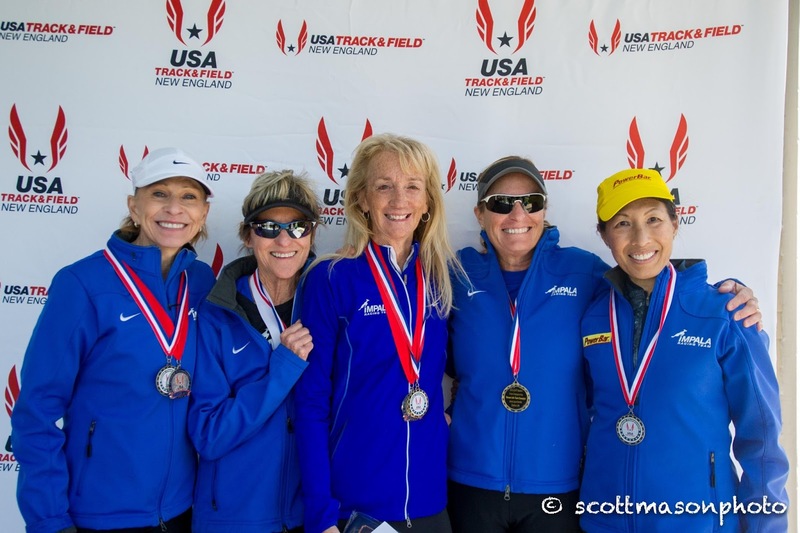 Last fall she won gold medals at the World Masters Athletics Championships in Australia in the 800 and 1500 Meters. Barbara Broad and Jo Anne Rowland are the favorites after Harvey. Broad would probably be favored right now because this is Rowland’s first race back from an injury. Both prefer longer races; Rowland’s fastest half marathon last year is about a minute faster than Broad’s half marathon this year. Harvey, Broad, Rowland. 70-74. 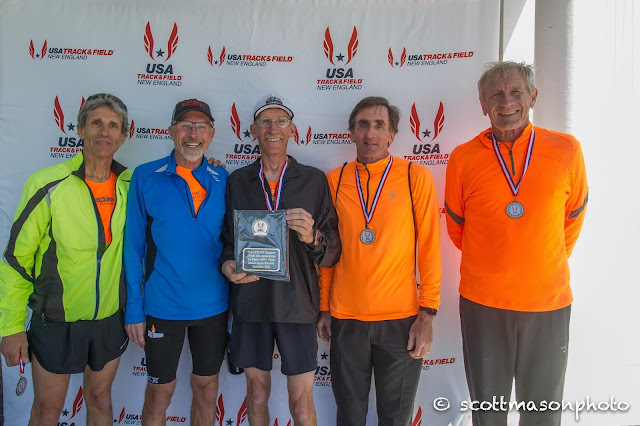 Gary Patton came over from the Track and Field side of the sport last year and took the gold on his way to the Men’s 70-74 Grand Prix title. He is not entered as of today. The 2nd place finisher, Przemek Nowicki, has been struggling with a recalcitrant hamstring and is not yet entered. Ed Smith, who finished third last year, has aged up to Men’s 75. Doug Goodhue, winner in 2015, who would otherwise be one of the favorites, has also moved up to Men’s 75. Of those entered so far, Jan Frisby and Paul Carlin, yours truly, appear to be the favorites. In 2015 Frisby ran 6:06 in finishing 2nd to Goodhue. But he has not been quite at that level of fitness since an Achilles injury sustained at the 5K Championships later that year. I have had to jog the course the last two years, running a little over 7:00 in 2015 and a little over 8:00 in 2016, due to injuries. This year I have been able to consistently average under 7:15 per mile for races of 8K to 10K length. That suggests something in the 6:15 to 6:30 range should be possible. I have been able to finish ahead of Frisby in the 8K and 10K Masters Championships earlier this year but all it would take is a few good weeks of training and Frisby would be right there. Carlin, Frisby. 75-79. If he were in his usual condition, this would be Doug Goodhue’s race for the taking. His main competition would come from Ed Smith. Goodhue took the Men’s 70 crown in 2015 with a 5:55; he was out with an injury last year and is just coming off of rehab. That kind of time will be out of his reach this year. He ran a 10K in July in 49:40 and is coming primarily for the team competition. Still I do not lightly rule out anyone who can win Age Division Runner of the Year 9 years in a row; his fitness could improve rapidly with some good weeks of training! Smith ran 6:56 last year to take 3rd place in the men’s 70-74 division. No one else entered at present should be able to break 7 minutes although Charlie Patterson may not be far off and could figure into the race for gold. He ran a 3:21.5 800 meters on the track this summer. Smith, Patterson [Goodhue? ].